Two University of Northwestern Ohio employees were presented with a Service Member Patriot Award from the Employer Support of the Guard and Reserve (ESGR) on April 5, 2019. Chad Bryan, Director of IT Infrastructure and Security, and Sara Fuller, IT Support Manager, were both nominated by former UNOH employee Tim Vernik, a member of the Ohio National Guard, to receive the awards. The Patriot Award reflects the efforts made by employees to support citizen warriors through a wide-range of measures including flexible schedules, time off prior to and after deployment, caring for families, and granting leaves of absence if needed. UNOH has been recognized for the past decade for being a military friendly institution, not just for military students, but also with regard to hiring and retaining military employees and their spouses. UNOH has many university leaders and employees who have served and are continuing to serve their country. Because of this, UNOH offers an understanding of the time commitment and the dedication that every soldier must give to serve. UNOH, from the President to each and every employee, is dedicated to helping veterans, as well as active service members, spouses, and their dependents. 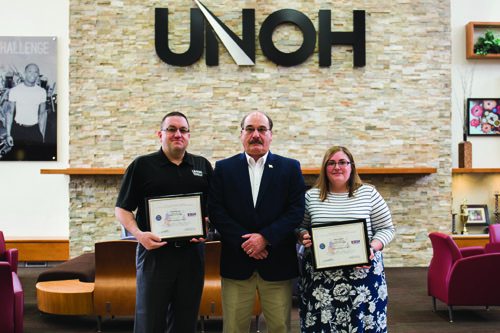 ESGR Volunteer Randy Gasser presented both awards to Chad and Sarah in the UNOH Student Commons Building.